Growing up in Nebraska, the closest family was nearly 8,000 miles away in Hong Kong and so our “family” was made of neighbors and co-workers of my Dad at the city utility offices. On the weekends, the adults would play cards, mah-jong (my parents taught everyone!) and have grand potlucks. We spent many weekends with one of Dad’s co-workers, Walt and his wife Alice, who had a lovely backyard full of fruit trees. They were an older couple and became Jay and my substitute “Grandma and Grandpa.” I remember vividly the massive netting contraption that Walt would drape over the majestic cherry tree once the fruit started ripening to prevent darting bird-theives from snatching the prized fruit. Every year in the summer, we’d be invited over for cherry harvesting, where the netting would be gently lifted off like a veil, revealing the layers and layers of branches holding bright red cherries ready for picking. The rest of the evening and days that followed were dedicated to pitting, pie-making and canning. Walt and Alice both passed away long ago and I wonder if that cherry tree still stands? I’ve been temped to ask my parents for their old address to use Google Earth to peer into the backyard, but that thought just kinda creeped me out! 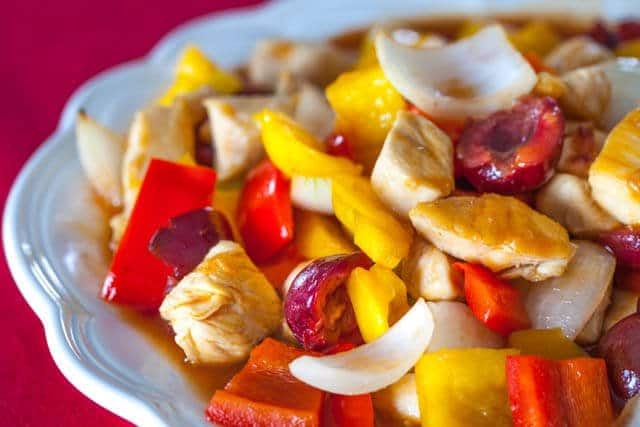 This recipe, Sweet and Sour Chicken with Cherries is a tribute to Walt and Alice. When we first moved to the United States, they welcomed us into their home and we became part of their family. Alice taught Mom how to bake Cherry Pie, Mom taught her how to Chinese Egg Rolls. They babysat me and my brother so that my parents could go out on a date. Alice patiently read some of my very first children’s books to me and helped me learn English! 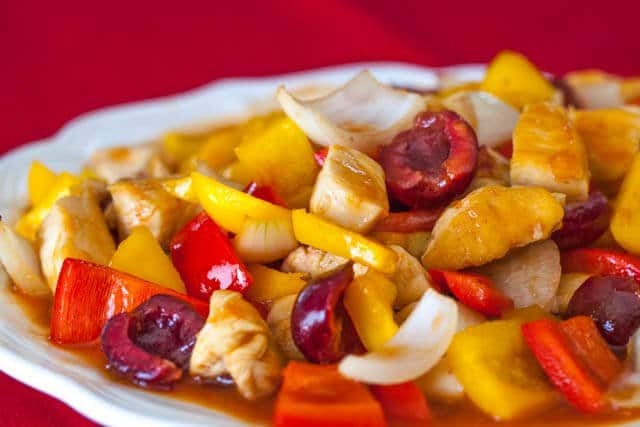 You can use either sweet or tart cherries with this recipe – this is a sweet and sour dish, so adjust the amount of honey or vinegar based on how sweet your cherries are. 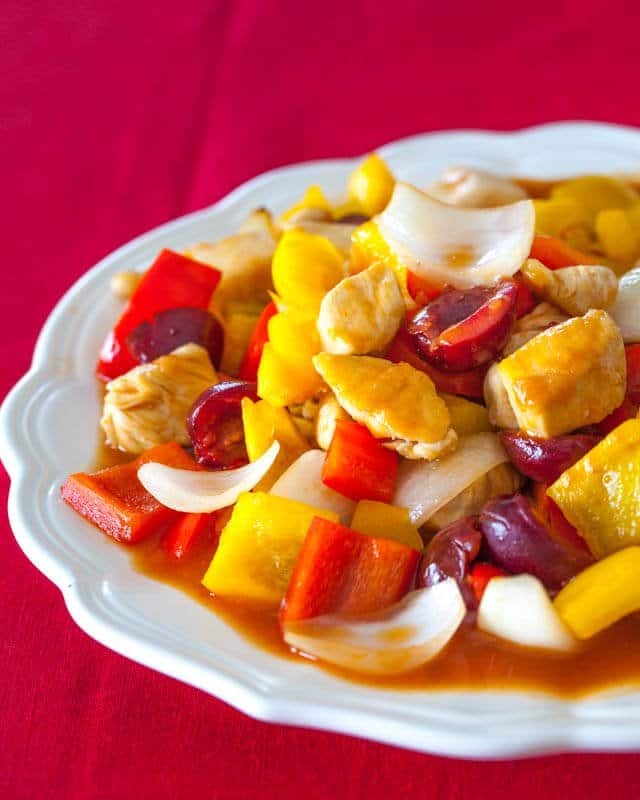 I love my Sweet and Sour Sauce – it’s a healthy version that uses orange juice for a nice fruity zing. If fresh cherries aren’t in your life right now, feel free to use another fruit – both fresh pineapple and mango work great. Oh, I’ve even used frozen, pitted cherries in the recipe with great results as well.